"Malczycki, a Ph.D. student in history at the University of Utah, has been translating and analyzing the 777 documents and fragments of the Utah Papyri Collection, believed to be the largest collection of Arabic papyri in North America. And he has found that 1,000 years ago, Egyptian businessmen were sophisticated, polite and literate." "Thousands of tourists gathered at Abu Simbel Temple early Friday morning to watch the sun rays while falling perpendicularly on the face of King Ramsis II's statue inside the sanctuary hall to greet him on his birthday. " "Egypt is indisputably a part of the Biblical tradition. This much is clear, not only from the role the country plays in providing the setting for certain famous episodes in both Old and New Testaments, but in the contribution made to the Hebrew worldview by its language, culture and thought. " An article about connections between the Egyptian and Hebrew civilizations. "An excavtation mission under Minnesota University in the US which is conducting excacavations in Wadi Qum Heleeg in Sharqeya desert unearthed 132 engravings dating back to pre-historic ages." A typically brief item from the Egyptian State Information service - if I find out more information I'll post it in. "Minister of Culture Farouq Hosni gave the green light to the Egyptian mission to resume excavation works in an area known as the valley of mummies in the Bahreya Oases in Giza governorate. " 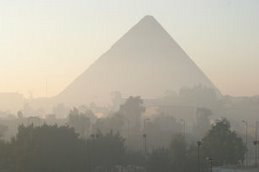 A Swedish engineering and environmental technology consultancy company will be working on a U.S.-led project aimed at rescuing the ancient temples of Luxor and Karnak in southern Egypt from rising groundwater. Short BBC News article about the repatriation of 600 ancient Egyptian items, four years after they were stolen, with a mention of Egypt's claims for a return of the Rosetta stone. "The terrorist bombings last week at resorts along Egypt's Red Sea coast raised fears of another slump in the country's tourism industry, a key sector of its economy. The industry is still recovering from the negative impact of the 2001 terrorist attacks in the United States, and earlier terrorist operations in Egypt that targeted tourists. Preliminary indications are that most tourists are not being deterred by the latest bombings." The article goes on to discuss this subject. Hawass - More Comments about the Great Pyramid "Secret Chamber"
Another Zahi Hawass article about the French claim to have found a secret chamber, this time in the context of a conversation with Omar Sharif. "The Graeco-Roman Temple of Khnum at Esna currently stands below ground level in the centre of the city, where it is subject to daily seepage from wastewater. The Supreme Council of Antiquities has decided to save what remains of the temple from any further damage by dismantling it and relocating it to a more suitable location. The decision as to where exactly it should be relocated has yet to be made." This article is quite a long one and as well a a short description of the temple, discusses the continuity demonstrated by the site between Pharaonic and Christian periods. It also describes some of the impacts of Roman rule on Egypt. An article on Alexandria, with a section in the middle on the ancient sections, with comments by archaeologists working there explaining about the pressures, in some instances, of Rescue Archaeology. "The French team excavating at Kharga Oasis have made an archaeological discovery 8 kilometers from Al-Monira village. The team unearthed a Greco- Roman cemetery embracing tombs carved in a sandstone hill". As well as one mummy with six toes one each foot, a couple of causes of death have been listed. More informative than usual for the SIS website. On the centenary of the opening of the Egyptian Geological Museum Al Ahram has an article talking about the history of geological expeditions and some of the great geologists who helped to clarify how Egypt developed as a land. It also talks about the important role of the Geological Museum. Egypt's fossil record is discussed - this lesser known aspect of Egypt is very important and impressive. Dr Okasha el Daly, was fealtured prominently in the Oberserver this weekend, discussing his research into early arabic research into Egypt. From the Observer website: "An expert in both ancient Egypt and ancient Arabic scripts, El Daly spent seven years chasing down Arabic manuscripts in private collections around the world in a bid to find evidence that Arab scholars had unlocked the secrets of the hieroglyph. He eventually found it in the work of the ninth-century alchemist, Ibn Wahshiyah. 'I compared his studies with those of modern scholars and realised that he understood completely what hieroglyphs were saying.' "
International Association of Egyptologists (IAE). Article about ancient beers, with a good reference to Barry Kemp's discovery of possible beer making facilities at Amarna in Middle Egypt and at the much older predynsatic site in Hierakonpolis in Upper Egypt. It discusses many different areas, inluding Vindolanda and the Andes, and provides a good popular overview. Thanks to Tony Cagle's blog for this link. It concerns the mummified remains, and the signs of the violent death, of the last Pharaoh of the Theban lands at the time when the Hyksos in the north and Nubia in the south was sandwiching the surviving Egyptian homeland in the Second Intermediate. In short, his skull was severely damaged, and I don't imagine his death was very pleasent! A really rather damning review of Joann Fletcher’s new book on Nefertiti from Archaeology Magainze. I flipped through it a couple of weeks ago, for about 10 minutes which, while not being a fair review, did confirm that it merely expanded her claims on the Discovery Channel programme rather than defending her position in any way, and this review confirms that my superficial impression was actually right. This article examines, in brief, but with skill, some of the evidence against Fletcher. A summary of the ups and downs of the ninth Congress, which is held every four years. This is a very good overview, describing everything from the chaotic organization of the conference centre in which it was held, to the individual content of some of the key papers. At 5 pages, this really is the best summary of the Congress I have seen so far.